Although G protein-coupled receptor (GPCR) internalization has long been considered as a major aspect of the desensitization process that tunes ligand responsiveness, internalization is also involved in receptor resensitization and signaling, as well as the ligand scavenging function of some atypical receptors. Internalization thus contributes to the diversity of GPCR-dependent signaling, and its dynamics and quantification in living cells has generated considerable interest. We developed a robust and sensitive assay to follow and quantify ligand-induced and constitutive-induced GPCR internalization but also receptor recycling in living cells. This assay is based on diffusion-enhanced resonance energy transfer (DERET) between cell surface GPCRs labeled with a luminescent terbium cryptate donor and a fluorescein acceptor present in the culture medium. GPCR internalization results in a quantifiable reduction of energy transfer. This method yields a high signal-to-noise ratio due to time-resolved measurements. For various GPCRs belonging to different classes, we demonstrated that constitutive and ligand-induced internalization could be monitored as a function of time and ligand concentration, thus allowing accurate quantitative determination of kinetics of receptor internalization but also half-maximal effective or inhibitory concentrations of compounds. In addition to its selectivity and sensitivity, we provided evidence that DERET-based internalization assay is particularly suitable for characterizing biased ligands. Furthermore, the determination of a Z′-factor value of 0.45 indicates the quality and suitability of DERET-based internalization assay for high-throughput screening (HTS) of compounds that may modulate GPCRs internalization. G protein-coupled receptors (GPCRs) are membrane proteins that respond to a wide variety of extracellular stimuli and play critical roles in intercellular communication (1). They are central to many physiological and pathological processes and represent one of the most important classes of drug targets. Classically, agonist-induced GPCR activation results in the activation of heterotrimeric G proteins and the accumulation of second messengers such as Ca2+, cyclic AMP, or inositol phosphates. During continuous agonist stimulation, GPCR activation diminishes through a process known as desensitization, which operates directly at the receptor and downstream. Desensitization is typically controlled by receptor phosphorylation mediated by kinases, including the family of GPCR kinases, which promotes the recruitment of β-arrestins to the receptor. In many cases, these processes also lead to receptor internalization, which generally proceeds by either a clathrin-coated pit or caveolae-mediated pathway (2). However, GPCR internalization is also known to promote receptor-mediated signaling and resensitization. Indeed, recent studies have shown that internalized GPCRs can continue to either stimulate or inhibit cAMP production in a sustained manner (3). Moreover, internalization also participates in the ligand-scavenging function of atypical GPCRs that constitutively cycle between the plasma membrane and intracellular compartments (4). Receptor internalization is a ubiquitous process and an indicator of activation for a wide variety of GPCRs including orphan receptors. Thus, internalization contributes to the diversity of GPCR-dependent signaling pathways and its dynamics in living cells has generated considerable interest. Although fluorescence microscopy permits the disappearance of labeled proteins from the cell membrane to be visualized, signals from labeled internalized receptors in intracellular compartments can also be detected, which can bias observations (5). Other techniques for directly measuring receptor internalization include Enzyme-Linked immunoabSorbent Assay (ELISA) and flow cytometry (6), but they are poorly suited for dynamic analyses due to the numerous washing steps involved in these methods, notably harsh treatments (e.g., acidic wash) to dissociate ligands from their receptors. Moreover, because only a small fraction of the receptors at the cell surface for any particular type GPCR undergo internalization, methods must be selective and sensitive to be precise. Hence, sensitive plate-based assays with high signal-to-background ratios have appeared for quantifying β-arrestin recruitment using bioluminescence resonance energy transfer (BRET) technology (7) or enzyme fragment complementation (8, 9) or for determining the extent of receptor internalization by monitoring changes in fluorescence resonance energy transfer (FRET) (10). Additionally, alternative strategies based on the quenching of internalized receptor tagged with a pH-sensitive fluorescent protein probes (11), NanoLuc® luciferase (12), or fluorogen activating protein (FAP) have also been used to monitor internalization (13). Here, we extended the use of a single labeling method, which displays the requested sensitivity compatible with high-throughput screening (HTS) for the dynamic and quantitative analysis of GPCR internalization. 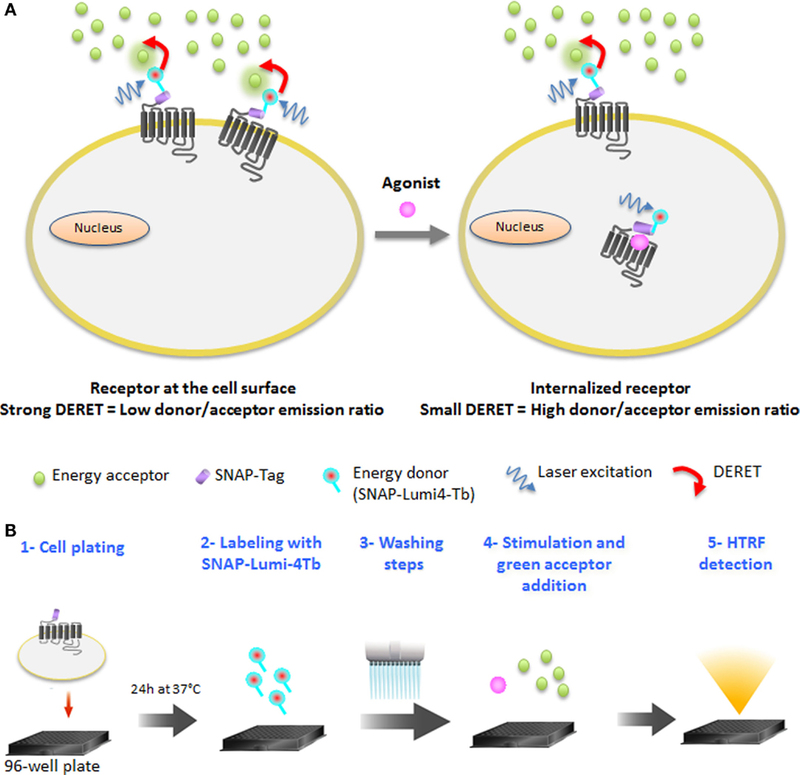 This diffusion-enhanced resonance energy transfer (DERET) method relies on the use of a luminescent terbium cryptate derivative that irreversibly labels cells expressing SNAP-tagged (ST) GPCRs. The ST is a derivative of O6-guanine nucleotide alkyltransferase, which can covalently react with fluorescent-conjugated benzyl guanine substrates (14). To validate the DERET as a reliable and quantitative assay for analysis of constitutive- and ligand-induced receptor internalization, we compared it to classic techniques for various GPCRs from the class A such as the vasopressin V1a and δ opioïd receptors and the two receptors of the CXCL12 chemokine (CXCR4 and ACKR3/CXCR7; named CXCR7 throughout the text), and from the class C such as the metabotropic glutamate receptors 5 (mGluR5) receptors. The Tag-lite® labeling medium (catalog reference LABMED) and SNAP-Lumi4®-Tb (catalog reference SSNPTBX) SNAP-tag (ST) fusion labeling system were conceived and synthesized by Cisbio Bioassays (Codolet, France). The 96-well plates and 384 small volume-well plates were purchased from Greiner Bio-One (Monroe, NC, USA). CXCL12 was provided by Dr. F. Baleux (Institut Pasteur, Paris, France). Arginine-Vasopressin (AVP) was from Bachem and SR49059 was a gift from Sanofi. Naloxone, SNC162, and SNC80 were obtained from Tocris Bioscience (Bristol, UK). Naltrindole, naltrexazone, methadone, morphine, DAMGO, glutamate, fluorescein, AMD3100 and poly-l-ornithine (MW of 30,000–70,000 Da) were from Sigma-Aldrich (St. Louis, MO, USA). Chalcone 4 was a gift from Dr. Bonnet, UMR7200, University of Strasbourg, Illkirch, France. Lipofectamine 2000 was purchased from Life Technologies (Cergy Pontoise, France). To obtain pRK5–Flag-ST–CXCR7 and –CXCR4 plasmids, the respective coding sequences in the pTRIP–CXCR7 and pTRIP–CXCR4 vectors (15) were amplified by PCR and inserted in the pRK5–Flag-ST–GB2 plasmid (gift from Dr. Pin, Institut de Génomique fonctionnelle, Montpellier, France) previously digested with MluI and HindIII to remove the GB2 coding sequence. The plasmid encoding the Flag-ST human CXCR7ΔCter truncated of 41 C-terminal residues (Δ322–363) was generated and provided by Cisbio Bioassays. HEK-293 cells stably expressing ST CXCR4 (catalog reference C1SU1CXCR4) and ST CXCR7 (catalog reference C1SU1CXCR7), ST V1a (catalog reference C1PU1V1A), ST V2 (catalog reference C1PU1V2) and CHO cells stably expressing ST δ opioïd receptor (catalog reference C2SU1DOP) were provided by Cisbio Bioassays. ST-receptors constructs used in this study have been described in previous reports and showed no alteration of their pharmacological and functional properties (14, 16–18). For the analyses of CXCR4, CXCR7, V1a, mGluR5, and δ opioid receptors, HEK-293 or CHO cells were grown at 37°C, 5% CO2 in complete culture medium (Dulbecco’s Modified Eagle’s Medium or HAM-F12 Medium, respectively, supplemented with 10% (v/v) fetal bovine serum, 4.5 g/l glucose, 100 U/ml penicillin, 0.1 mg/ml streptomycin, 1 mM glutamine, and 20 mM HEPES) (all reagents were obtained from Life Technologies). Cells stably expressing ST receptors were grown in complete culture medium supplemented with 0.6 mg/ml geneticin. Transient expression in HEK-293T cells was achieved using the transfection reagent, FuGene 6 (Roche, Basel, Switzerland) or by reverse transfection using Lipofectamine 2000 (Life Technologies). Briefly, for the reverse transfection, 96-well plates were coated with poly-l-ornithine (50 μl of 10 mg/ml) for 30 min at 37°C. After washing, transfection mixes were added to the plate and pre-incubated for 20 min at room temperature. Then, 1–2 × 103 cells were plated in each well and incubated at 37°C under 5% CO2 for 24 h.
Internalization assays for CXCR4 and CXCR7 were performed in 96-well culture cell plates using HEK-293T cells as described above. For transient transfection, cell culture medium was removed 24 h after transfection and 100 nM of SNAP-Lumi4-Tb previously diluted in Tag-lite labeling medium was added (50 μl per well) and further incubated for 1 h at 4°C. Excess SNAP-Lumi4-Tb was removed by washing each well four times with 100 μl of Tag-lite labeling medium. Internalization experiments were performed by incubating cells with Tag-lite labeling medium, either alone or containing CXCL12, in the presence of fluorescein. Typically, in plates containing SNAP-Lumi4-Tb-labeled cells, 50 μl of medium containing CXCL12 at the indicated concentrations was added, immediately followed by the addition of 50 μl of 48 μM fluorescein. ST-V1a receptor internalization assay was monitored as described below. ST-δ opioïd receptor internalization was monitored at room temperature on a CHO cell line stably expressing the receptor in either 96-well plates (1 × 105 adherent cells per well) or 384 small volume well plates (5 × 103 cells in suspension per well). ST-δ opioid receptor labeling and internalization measurement following addition of δ opioïd ligands (the agonists SNC162, SNC80, morphine, methadone, and the antagonists naloxone, naltrindole, and naltrexazone) but also μ opioïd ligand such as the agonist DAMGO (17) were done as described above. Surface expressed V1a in HEK-293 stably expressing the receptor were labeled with SNAP-Lumi4-Tb substrate for 1 h at 4°C. The excess of SNAP-Lumi4-Tb was then removed by washing each well three times with Tag-lite labeling medium. For kinetic internalization experiments, cells were stimulated with 1 μM and receptor expression levels determined at 37°C by measuring the SNAP-Lumi4-Tb fluorescence intensity at 620 nm over time. Dose–response experiments were performed on cells in the presence of increasing concentrations of AVP. Receptor expression levels were then evaluated after 1 h of incubation at 37°C. Real-time recycling of V1a was analyzed by stimulating cells with the agonist AVP and the antagonist SR49059. Forty-five minutes following AVP addition, SR49059 was added to block receptors internalization and to detect any recycled ST-V1a receptors at the cell surface. Cells expressing ST-δ receptor and ST–CXCR7 expressing cells were seeded in 8-well slides for 24 h. Cell surface ST-δ receptor molecules were labeled during for 30 min with the cell-impermeable O6-benzylguanine derivative cell impermeable SNAP-Alexa Fluor 488 (New England Biolabs, Ipswich, MA, USA) at room temperature. Cells were washed three times with Krebs/Tris buffer and incubated for 30 min with either Tag-lite medium either alone or containing SNC162 (10 μM) or naloxone (10 μM). ST–CXCR7 cells were labeled for 1 h with SNAP-red (Cisbio Bioassays) at 4°C and then warmed to 37°C for 1 h to visualize constitutive internalization. Fluorescence was detected on a Zeiss fluorescent microscope with a xenon flash lamp using a GFP or Cy5 filter cube and a Zeiss Plan Apo 63× (1.40 oil) objective. Signals emitted at 620 and 520 nm were collected at the indicated times using time-resolved settings for the donor (1500 μs delay, 1500 μs reading time) and acceptor (150 μs delay, 400 μs reading time). Ratio 620/520 (R) was obtained by dividing the donor signal (620 nm) by the acceptor signal (520 nm) at a chosen time and multiplying this value by 10,000. Data are expressed as percent of maximal internalization [“% of max. internalization (620/520 nm)”] and were calculated using the following formula: [(Rt – Rmin)/(Rmax – Rmin)] × 100 where Rt corresponds to the ratio observed at a chosen time. Dose–response curves were fitted using non-linear regression dose–response “log [ligand] versus responses (with three parameters except for CXCR7)” routine of Prism 5 (GraphPad Software, La Jolla, CA, USA) to provide the maximal (Emax) and half maximal effective concentration EC50 values. The half-time (t1/2) determination for internalization of the V1a receptor was made by fitting data using a single-phase exponential decay equation with Prism 5 (GraphPad Software, La Jolla, CA, USA). In this study, we used a time-resolved FRET-based receptor internalization assay to characterize the dynamics of vasopressin, opioïd, chemokine, and glutamate receptors internalization in real-time in response to different ligand concentrations. Lanthanide-based resonance energy transfer techniques such as HTRF (19) have become the standard for high-performance assays in GPCR activation, mainly due to the millisecond lifetime of the lanthanide excited state and the possibility to reduce cellular background emission (20–22). An interesting phenomenon of luminescent lanthanide complexes is that, due to their elevated millisecond excited-state lifetimes, collisional quenching of their luminescence by acceptor chromophores occurs at low concentrations. This DERET (23–25) phenomenon has already been used to detect electrostatic interactions on proteins (26, 27) and to monitor translocation of lanthanide complexes (10, 28). DERET depends on, among other things, the acceptor concentration and the shortest possible proximity that can occur between the donor and acceptor (23). The DERET was developed to be an efficient internalization and recycling assay (29). It includes the water-soluble terbium cryptate donor (30), which is kinetically very stable, has an exceptionally bright luminescence when excited at 337 nm, and most importantly, does not exhibit a specific binding to cells (16). The O6-benzylguanine moiety is able to covalently label the ST (ST) developed by Keppler et al. (31) and has been used to monitor receptor internalization with fluorescence microscopy using classic fluorophores (31–33). The ST is a derivative of O6-guanine nucleotide alkyltransferase, which can covalently react with fluorescent-conjugated benzyl guanine substrates (14). To reduce non-specific labeling due to high substrate concentrations, a methyl-benzamide moiety was added to the benzylguanine group to further enhance its reactivity with the ST protein (34). This modification did not alter the quantum-yield of luminescence relative to the parent compound described by Xu et al. (30). Thus, DERET internalization assay relies on the use of a luminescent terbium cryptate derivative (SNAP-Lumi4-Tb) to label irreversibly the cells expressing the ST-GPCRs. Consequently, an efficient DERET should occur if cells expressing a lanthanide complex-labeled receptor on their surface are incubated with micromolar concentrations of an acceptor. Internalization of labeled receptors will prevent the interaction between donor and acceptor and reduce DERET signal intensity (Figure 1A). The receptor internalization assay includes five steps (Figure 1B). To validate the strategy, we compared DERET to a classic method, which consists in evaluating receptors remaining at the cell surface after agonist stimulation. 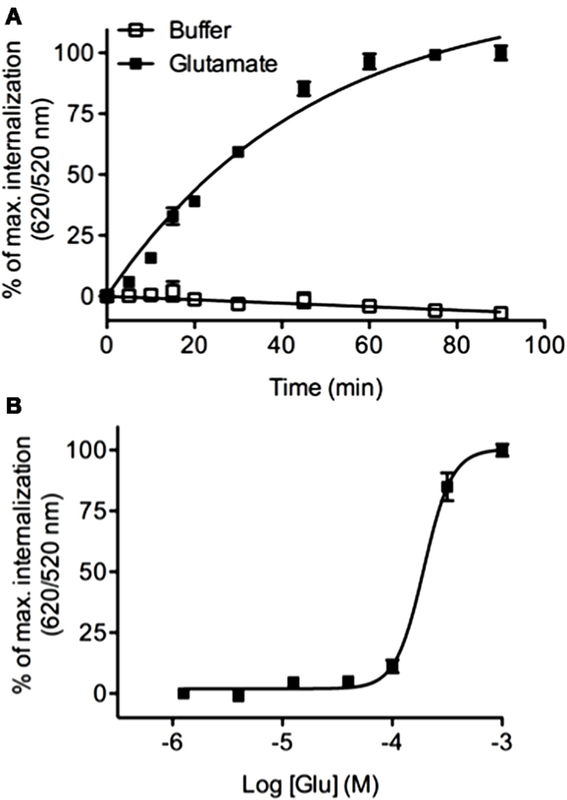 HEK-293 cells stably expressing the ST-vasopressin V1a receptor were incubated either in the presence of a constant AVP concentration for variable time to define kinetics of receptor internalization or in the presence of increasing concentration of AVP to establish the dose–response internalization curves. In a final step, cells were incubated with the non-cell-permeable SNAP-Lumi4-Tb in order to label exclusively receptors which remain at the cell surface. Because DERET assays consist in monitoring the internalized receptor fraction, AVP stimulation resulted in a dramatic increase of fluorescence 620/520 nm ratio (Figure 2A). By contrast, in the classic method, AVP stimulation resulted in a decrease of the fluorescence signal (Figure 2A), indicating receptor depletion from the cell surface. Fluorescence signals were plotted in function of the duration of the incubation with agonist and fitted with a one exponential decay equation routine. The half-time constants (t1/2) were respectively 9.86 ± 0.004 min and 11.42 ± 0.009 min. Similarly, variations of the fluorescent signals were investigated in function of various AVP concentrations after 1 h incubation (Figure 2B). EC50 values determined after fitting experimental data were 2.7 ± 0.06 and 7.7 ± 0.11 nM for DERET and the classic method, respectively. The consistency of the kinetics time constants and EC50 values obtained with the two different techniques proves the validity of the DERET strategy to investigate receptor internalization. Figure 2. Comparison between DERET-based internalization assay and measure of receptor cell surface expression. (A) V1a internalization was monitored over time in response to 1 μM of AVP or (B) in the presence of increasing concentrations of AVP for 1 h at 37°C. Analysis was performed side-by-side using DERET assay (red line and right Y axis) and by measuring receptor expression levels at the cell surface after stimulation by AVP (black line and left Y axis) as described in the Section “Materials and Methods.” The data are mean ± SD from three independent experiments performed in triplicate. Once internalized, receptors can either be degraded or rapidly recycled at the cell surface like the V1a receptor in response to AVP (35). To investigate this recycling, the internalization profile after agonist stimulation was compared to that upon the addition of an antagonist, in a second step. After the addition of an excess of SR49059 (10 μM), a selective antagonist of V1a receptor, the fluorescence ratio decreased to a level comparable to the one in non-stimulated cells (Figure 3). This decrease reflects the re-targeting of labeled ST-V1a receptors at the cell surface thus demonstrating the recycling of the V1a receptor. DERET is therefore a reliable strategy to follow agonist-induced receptor internalization and recycling. Figure 3. Real-time internalization and recycling of vasopressin V1a receptor. 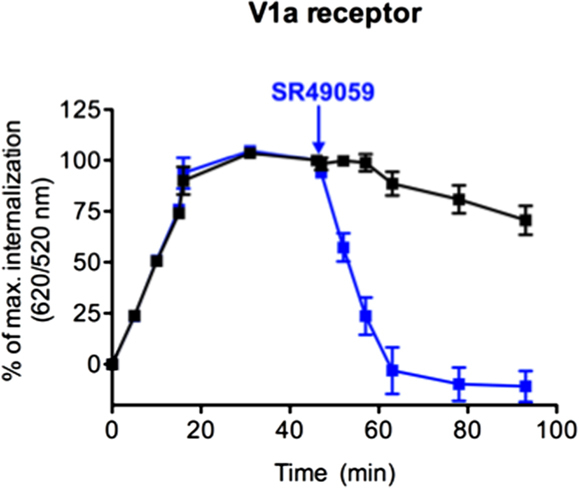 Following V1a internalization induced by AVP (1 μM) for 45 min, an excess of the antagonist SR49059 (10 μM) was added (at the time indicated by arrow) to stop internalization and to induce receptor recycling. Black line represents V1a internalization induced by AVP (increase 620/520 ratios). Blue line represents V1a internalization and recycling illustrated by an increase and a decrease in 620/520 ratios, respectively. Percent of ratios were plotted as a function of time and data represent mean ± SD from two independent experiments carried out in triplicates. Ligands can differ in their ability to activate distinct signaling cascades through the same receptor. This phenomenon is named functional selectivity or biased signaling. Recent studies have shown that the propensities of GPCR ligands to promote internalization do not necessarily correlate with agonist efficacy. For example, when considering opioïd receptor, some ligands can induce rapid receptor internalization while others such as morphine do not (36). We analyzed δ opioïd receptor internalization using CHO cells stably expressing the ST-receptor (17). 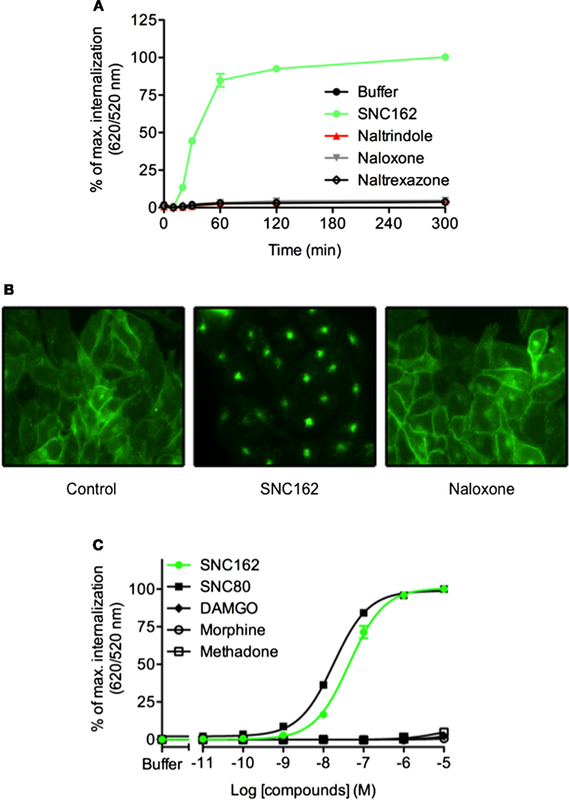 After optimizing the labeling of the receptor and signal measurement conditions (Figure S1 in Supplementary Material), we demonstrated that SNC162 induced a dramatic receptor internalization while antagonists (naltrindole, naloxone, and naltrexazone) did not change the fluorescence ratio (Figure 4). Expression of the δ receptor at the cell membrane and its internalization were confirmed by fluorescence microscopy (Figure 4B). We next performed dose–responses experiments with some opioïd receptors agonists to analyze their functional selectivity. We found that SNC162 and SNC80 promoted ST-δ receptor internalization in a dose-dependent manner (Figure 4C). EC50 was 43.9 ± 0.04 nM for SNC162 and 18 ± 0.02 nM for SNC80 (Figure 4C), values, which are similar to the ones reported with other methods (37, 38). In contrast, morphine and methadone did not trigger receptor internalization although they are full agonists of δ opioïd receptor for the Gi/o signaling pathway thereby demonstrating that they are biased agonists. As expected, the specific μ receptor agonist, DAMGO did not increase the fluorescence ratio, proving the specificity of the assay. Thus, DERET assay can be a relevant strategy to screen for biased agonists on internalization pathway. Figure 4. DERET assay for identification of biased ligand of the δ opioïd receptor. (A) ST-δ receptor receptor internalization in the presence of the indicated δ receptor-ligands (10 μM) was measured after first incubating the plate at 4°C (t = 0) and then transferring it to room temperature for 5 h. Data represent mean ± SD from one representative experiment carried out in triplicates (B) Wide field fluorescence microscopy imaging of ST-δ receptor internalization. ST-δ receptor cells labeled with O6-Benzylguanine-Alexa-488 were treated with SNC162 (10 μM) or naloxone (10 μM) for 30 min at room temperature. Receptor internalization was visualized by fluorescence microscopy. Cells expressing labeled ST-δ receptor incubated in the presence of buffer were used as a negative control. (C) Dose–response curves analysis of δ receptor. ST-δ receptor expressing cells were incubated with indicated concentrations of SNC162 (closed green circle), SNC80 (closed square), morphine (open circle), methadone (open square), DAMGO (closed triangle) and internalization measured after 1 h at 37°C Data represent mean ± SD from three independent experiments carried out in triplicates and fitted using non-linear regression dose–response log [ligand] versus response with three parameters. We sought to extend the DERET internalization assay to other receptors including those which display constitutive internalization. To do so, we compared the internalization profiles of the CXCR7 and CXCR4 receptors, which share the same agonist (CXCL12) but respond to it differently (15, 39–41). CXCL12 is required during embryonic development and regulates many pathophysiological processes in adults (42) but the direct contribution of CXCR7 to CXCL12 functions remains largely unknown (43). In contrast to CXCR4, CXCR7 does not activate the typical Gαi pathways of chemokine receptors but signals through β-arrestins (44). Although both CXCR4 and CXCR7 are internalized following stimulation with CXCL12, CXCR7 also displays an atypical propensity to constitutively internalize. Thus, like other atypical chemokine receptors, CXCR7 is thought to act as a decoy receptor that helps to shape CXCL12 gradients and modulate CXCR4 function (2, 43, 45, 46). We investigated the internalization kinetics of CXCR4 and CXCR7 in HEK-293 cells expressing chimeric receptors bearing ST (ST–CXCR4 or ST–CXCR7). Both fusion proteins were expressed normally and showed no alteration of their functional properties (data not shown). Kinetic analyses of receptor internalization were performed at 37°C in the presence or absence of CXCL12 (200 nM). CXCL12 stimulation greatly increased 620/520 ratio in cells expressing ST–CXCR4 compared to the signal in non-stimulated cells (Figure 5A, blue dashed curve versus blue solid curve, respectively). These data indicate that CXCR4 was internalized solely in the presence of CXCL12. By contrast, we detected a high fluorescence ratio in cells expressing ST–CXCR7 whether or not they were stimulated with CXCL12 (Figure 5A, red dashed curve versus red solid curve, respectively). These results indicate that CXCR7 can undergo ligand-dependent as well as ligand-independent internalization. It is noteworthy that the stimulation with CXCL12 induced a moderate change in the magnitude of the fluorescence ratio and slightly enhanced the CXCR7 internalization rate over time. These data extend previous findings showing that CXCL12 treatment has little effect on endogenous CXCR7 internalization in breast cancer cells (45). The constitutive internalization of the CXCR7 receptor was also confirmed in living cells by fluorescence microscopy after the cell surface-expressed ST-receptors were labeled with the cell-impermeable SNAP-Red fluorescent substrate (Figure 5B). Shifting labeled cells from 4 to 37°C for 1 h caused the labeled-receptors to become highly concentrated intracellularly, confirming the propensity of the CXCR7 receptor to internalize in a ligand-independent manner (Figure 5B). CXCL12-induced ST–CXCR4 internalization was inhibited by AMD3100, a specific CXCR4 antagonist (47) and by chalcone 4, a CXCL12 neutraligand (48), which provided further evidence that this internalization was specific to CXCL12-mediated receptor activation (Figure 5C, green and purple squares, respectively). CXCL12 stimulation of cells expressing either ST–CXCR4 or ST–CXCR7 promoted a dose-dependent receptor internalization (Figure 5D), with EC50 values of 4.15 ± 0.07 nM for ST–CXCR4 and 9.7 ± 0.05 nM for ST–CXCR7, both of which agree with previous findings (15, 49, 50). Figure 5. 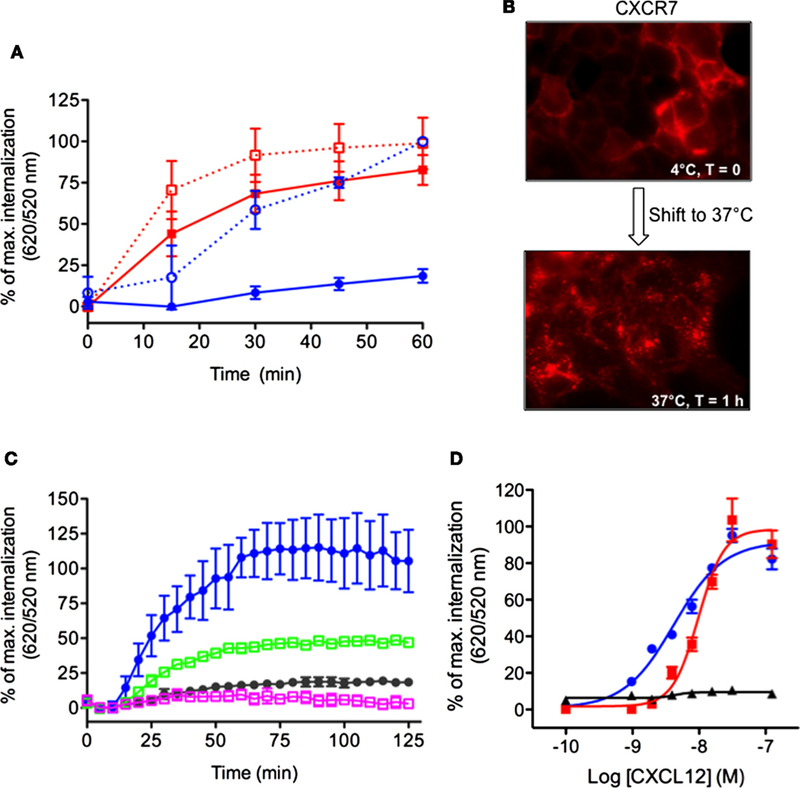 Simultaneous detection of constitutive and CXCL12-induced internalization of CXCR4 and CXCR7 chemokine receptors. (A) Kinetic analysis of receptor internalization in HEK-293 cells stably expressing ST–CXCR4 or ST–CXCR7 and labeled with SNAP-Lumi4®-Tb. At the end of the labeling period, cells were transferred to 37°C (t = 0) and internalization was monitored in the presence or absence of 200 nM CXCL12. Results (mean ± SEM) were from three independent experiments performed in duplicate. (B) Constitutive internalization of ST–CXCR7 visualized by fluorescence microscopy. Cells expressing ST–CXCR7 were labeled with SNAP-red substrate at 4°C for 1 h and then were either held at 4°C for 1 h (upper panel) or transferred to 37°C for 1 h (lower panel) before being analyzed. (C) HEK-293 cells stably expressing ST–CXCR4 were incubated with buffer or CXCL12 (200 nM) alone or with 25 μM AMD3100 (a selective CXCR4 antagonist) or 25 μM chalcone 4 (a CXCL12 antagonist) for 1 h at 4°C. Internalization was then monitored at 37°C for 2 h. Results (mean ± SEM) were from three independent experiments. (D) Doses response curves of CXCR4, CXCR7, and CXCR7ΔCter internalization induced by CXCL12. Cells transiently expressing ST–CXCR4 (blue line), ST–CXCR7 (red line), or ST–CXCR7ΔCter (black line) were labeled with SNAP-Lumi4-Tb. Internalization was then measured in the presence of various CXCL12 concentrations for 1 h at 37°C. Data are fitted using non-linear regression dose–response log [agonist] versus response with four parameters. Results (mean ± SEM) were from three independent experiments performed in duplicate. β-arrestins bind to the carboxyl terminus domain (C-ter) of CXCR7, which is essential for CXCL12-induced receptor internalization (39, 44, 51). Analyses performed in cells transiently expressing labeled receptors confirmed that ST–CXCR7 was constitutively internalized over time (Figure 6A, red curve) but that internalization of a receptor lacking the C-ter domain, ST–CXCR7ΔCter, was almost completely abolished (Figures 5D and 6A, black curve). Flow cytometry analysis showed that similar amounts of ST–CXCR7ΔCter and ST–CXCR7 proteins were present at the cell surface of transfected cells, thus excluding a defect in ST–CXCR7ΔCter expression (Figure 6B). The DERET assay allows investigating ligand-independent (constitutive) and -dependent internalization. Figure 6. The C-terminus of CXCR7 is essential for internalization. (A) Kinetic analysis of constitutive internalization of ST–CXCR7 (wild type; red curve) and ST–CXCR7ΔCter (lacking the C-terminus; black curve). HEK-293T cells transiently expressing one type of receptor were labeled with SNAP-Lumi4®-Tb. At the end of the labeling period (t = 0), internalization was followed over time at 37°C and plotted as a function of time. Results (mean ± SEM) were from three independent experiments performed in duplicate. (B) Cell surface expression levels of CXCR7 receptors in HEK-293T cells transiently expressing Flag-ST–CXCR7 or Flag-ST–CXCR7ΔCter. Representative flow cytometry profiles of ST–CXCR7 (black histogram) and ST–CXCR7ΔCter expression (light gray histogram) were determined using anti-CXCR7 antibody. Filled gray histograms show staining with isotype control mAb. Receptor expression is shown as mean fluorescence intensity. To evaluate the suitability of DERET assay for HTS, we determined the Z′-factor, a performance indicator that takes into account both signal dynamic range and variation of experimental data (52). In HTS, a Z′-factor value between 0 and 0.5 is considered as acceptable. 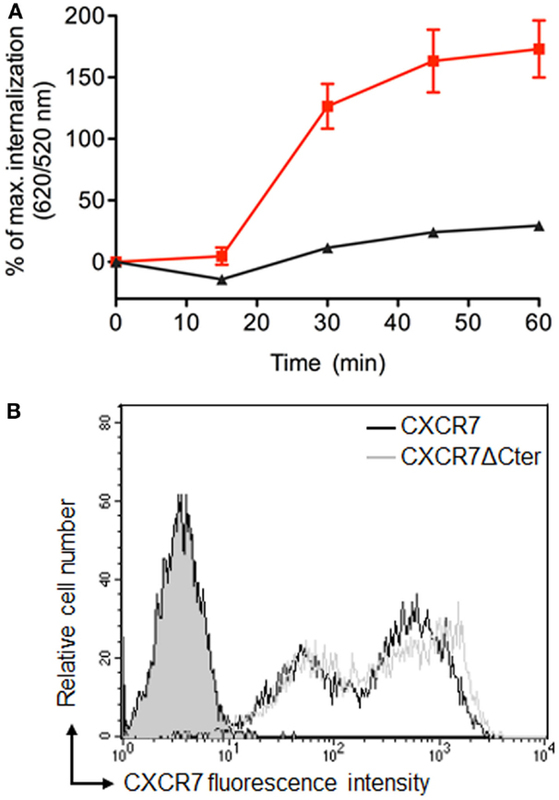 We calculated the Z′-factor value for the DERET assay based on CXCR4 internalization in ST–CXCR4 stably expressing cells stimulated with CXCL12 (Figure 7). We found a Z′-factor value of 0.45, which demonstrated the soundness of the DERET assay for screening compounds that can potentially modulate receptor internalization and expression at the cell surface. Figure 7. 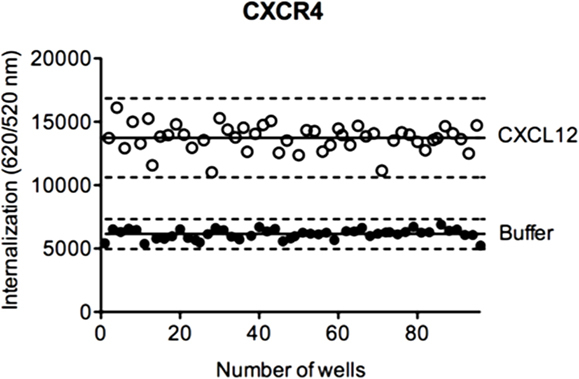 Z ′-factor determination in CXCR4 internalization assays. HEK-293 cells stably expressing ST–CXCR4 were labeled with SNAP-Lumi4®-Tb. At the end of the labeling period (t = 0), cells were incubated with an excess of acceptor and stimulated or not with 200 nM of CXCL12. Internalization of CXCR4 was followed at 37°C for 1 h as described in the Section “Materials and Methods.” The Z′-factor was obtained according to the published methods by Zang et al. (52). The scatter plot represents the 48-well positive controls data (with CXCL12, open circle) and the 48-well negative control data (with buffer, closed circle). Solid lines represent the mean internalization signal and dashed lines represent three SD above and below. Previous studies have reported that the class C mGluR5 GPCR undergoes a rapid internalization in response to glutamate (53). We analyzed mGluR5 internalization by performing kinetic and dose–response experiments using HEK-293 cells stably expressing the ST-receptor. We found that the glutamate agonist was able to promote a time (Figure 8A) and concentration dependent (Figure 8B) internalization of mGluR5 (EC50 = 193.3 ± 0.03 μM) thus extending the DERET assay to class C GPCR. Figure 8. Real-time internalization of mGluR5. (A) ST-mGluR5 expressed at the cell surface were labeled with SNAP-Lumi4-Tb. Cells were subsequently incubated with an excess of acceptor in the presence of 1 μM of glutamate (closed square) or in absence of agonist (open square). Internalization of mGluR5 was measured at 37°C over time. Data represent mean ± SD from three independent experiments performed in duplicate. Data were fitted using one phase association equation. (B) Dose–response curve for mGluR5 in response to glutamate. Cells were stimulated for 1 h with increasing concentrations of glutamate and internalization was monitored. Data represent mean ± SD from three independent experiments performed in triplicate and were fitted using non-linear regression dose–response log (agonist) versus response with three parameters. In conclusion, we provided compiling evidence that the DERET strategy is offering many advantages compared to other internalization assays and constitutes an attractive technology to monitor receptors internalization: (i) The assay is compatible with various receptors models as shown here for receptors of amino-acids such as mGluR5 receptors, of peptides such as vasopressin or opioïd receptors, of proteins such as CXCR4 and CXCR7 receptors and for receptors such as CXCR7 undergoing a ligand-independent internalization and finally previously for receptors of bioamine (54); (ii) the technique is very easy to implement since it is based on a single labeling step by contrast to other conventional techniques based on multiple labeling steps separated by cold acid washing steps; (iii), the method is sensitive due to the use of cryptate of terbium, Lumi4-Tb. Its long lifetime allows to pass over the short-lived fluorescence resulting from auto-fluorescence of the biological samples or medium and directly excite the acceptor, dramatically decreasing the signal to noise ratio. DERET-based assay can also be extended to other tag-mediated labeling utilizing self-labeling proteins such as CLIP-Tag and Halo-Tag, which are reacting covalently with an exogenously supplied substrate that is linked to different fluorescent dyes thereby multiplying the labeling possibilities; (iv), it is a quantitative method to estimate the amplitude of the internalization process and compatible with kinetics and dose–response experiments, allowing characterization of pharmacological parameters and the identification of biased agonists; (v), the receptor is directly and covalently labeled allowing tracking the receptor itself and not the complex between the receptor and the ligand. This is particularly important to study receptor recycling or degradation since the fusion of endosomes to lysosome induces an acidification of the vesicular medium and the dissociation of the ligand/receptor complex; (vi), the reduced number of steps of the DERET strategy and the high signal/noise ratio make this assay suitable for HTS as supported by the Z′-value characterized in this study. The major drawback of DERET is that it relies on chimeric receptors and is not compatible with the investigation of endogenous receptors. Nevertheless, to our knowledge, no effect of self-labeling domains (ST, CLIP-tag, HaloTag) have been reported so far on the pharmacology of the receptors (14, 16, 55–57). It is also noteworthy that DERET does not allow an absolute but a relative quantification, making difficult the comparison of the DERET signal obtained on different receptor models. Moreover, in the time course of an experiment, neo-synthesized receptors that have reached the cell surface will not be considered since they have not been labeled. This limitation could eventually impact the accuracy of the quantification of the internalization in case of large over-expression of the receptor. To conclude, we have shown that DERET is a relevant strategy to study internalization kinetics, dose–response internalization, receptor recycling, receptor constitutive internalization and to screen for biased ligand. DERET is therefore of broad interest to study GPCR internalization. AL initiated and performed most of the experiments and wrote the manuscript. MC, AJ-R, LK, SB, JZ, DM, participated in the experiments and analyses, ET, KB, and LP participated in project support. FB and TD initiated and supported the project and participated to the analyses and to the writing of the manuscript. All authors critically reviewed the manuscript and approved the final version. Lumi4 and Tag-lite are registered trademarks of Lumiphore and Cisbio Bioassays, respectively. This work was supported by SIDACTION (AI21-1/01708), AP-HP, Agence Nationale de la Recherche (ANR-07-MRAR-029). We thank the ARPEGE (Pharmacology Screening-Interactome) platform facility at the Institut de Génomique Fonctionnelle (Montpellier, France). MC was supported by the “Fondation pour la Recherche Médicale” and LK by the Laboratory of Excellence in Research on Medication and Innovative Therapeutics (LERMIT, Investissements d’Avenir-ANR-10-LABX-0033-LERMIT). We are grateful to Dr. Françoise Baleux (Unité de Chimie Organique, Institut Pasteur, Paris, France) and Dr. D. Bonnet (UMR7200, University of Strasbourg, Illkirch, France) for the generous donation of CXCL12 and Chalcone 4 respectively, and thank Dr. F. Arenzana-Seisdedos (Laboratoire de Pathogénie Virale, Institut Pasteur, Paris, France) for his support of the project. We thank Drs. R. Jockers and J. Dam (Pharmacologie fonctionnelle et Physiopathologie des Récepteurs Membranaires, Institut Cochin, Paris, France) for critical reading of the manuscript and Drs. K. Liittschwager and J. Harriague (4Clinics, Paris, France) for editing the manuscript. 2. Ferguson SSG. Evolving concepts in G protein-coupled receptor endocytosis: the role in receptor desensitization and signaling. Pharmacol Rev (2001) 53:1–24. 19. Mathis G. Probing molecular interactions with homogeneous techniques based on rare earth cryptates and fluorescence energy transfer. Clin Chem (1995) 41:1391–7. Copyright: © 2015 Levoye, Zwier, Jaracz-Ros, Klipfel, Cottet, Maurel, Bdioui, Balabanian, Prézeau, Trinquet, Durroux and Bachelerie. This is an open-access article distributed under the terms of the Creative Commons Attribution License (CC BY). The use, distribution or reproduction in other forums is permitted, provided the original author(s) or licensor are credited and that the original publication in this journal is cited, in accordance with accepted academic practice. No use, distribution or reproduction is permitted which does not comply with these terms. †Agnieszka Jaracz-Ros and Laurence Klipfel have contributed equally to this work. ¶Thierry Durroux and Françoise Bachelerie have contributed equally to this work.